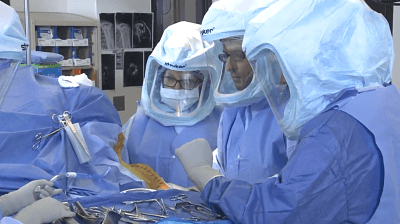 Surena Namdari, MD, from The Rothman Institute in Philadelphia, Pennsylvania, performs a reverse total shoulder arthroplasty on a 64-year-old, right hand-dominant male patient in a procedure broadcast live from ICJR’s 7th Annual Shoulder Course. The patient had a 5-year history of left shoulder pain and weakness that had been well-managed with injections and physical therapy. He then experienced a lifting injury that left him with worse pain and the inability to raise his left arm. He failed to regain overhead elevation following 12 weeks of injections and physical therapy. Click the image above to watch Dr. Namdari perform the reverse total shoulder arthroplasty. Dr. Namdari has disclosed that he receives research support from Arthrex, Integra, and Zimmer Biomet; that he has stock or stock options in Force Therapeutics, MDLive, MDValuate, Parvizi Surgical Innovations, and RubiconMD; that he is a paid consultant for Flexion Therapeutics and DePuy Synthes; that he receives royalties and research support from and is a paid presenter or speaker for DJO Surgical; and that he receives royalties from and is a paid consultant and paid presenter or speaker for Miami Device Solutions.